That was the question I was asked by friends and people at work - hard to believe I would buy a used Saturn; especially since the company is now defunct. Why the 2002 Saturn S-Series? 2002 Saturn SC2 is a very sporty looking car; black color is to me the best color for this car to be painted - hides the 3rd door perfectly! Many people love the nose of the car; daughter likes it very much will likely be her car in a few years. The Regal looked like an "older persons" car - the Sonata (2001 and 2002 models driven) - simply were not as good a looking car. 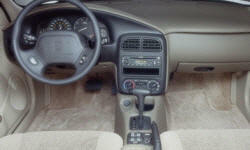 Compared to the 1994 SL2 this replaced, the interior is a huge step forward. Color match (tan in this case) is good, not too sure about the darker brown "accent" trim pieces. I like the overall look of the interior compared to other cars of the same vintage that I looked at - including the Sonata and the Regal. Driving position/comfort a plus over the 94. Much quieter inside. Easy to find a comfortable position but had to adjust seat height. Horn and cruise control much easier to use in the 02. Other controls easy to get to as well; wish the lock/window/mirror controls were lighted at night. Much better than driving the Sonata - never got quite comfortable - and the Regal seats (on each of the ones I drove) felt like they were full of wet newspapers! 94 SL2 went 300K miles and was sold still running/driveable. Hoping the 2002 SC2 will be as reliable. 94 was great in the snow (ABS and Traction Control w/Auto). Snow storm in Jersey 3rd day I had car gave same results. Gas mileage on the 94 was life time at 31.6 (bought car used with 38K on it) So far '02 has done better MPG and is much quieter inside. The ride was comparable to the Buick Regal with the Gran Sport suspension - taught - but - not rough. A little harsher over bumps. Cornered far better. Hyundai felt more like what I expected the Buick to feel like. Saturn feels/rides a lot like my wife's Volvo C70 (just without the incredible seats and get-up-and-go!!!) The 94 SL2 NEVER rode as nicely, sounded as quietly or ran as smoothly as the 02. 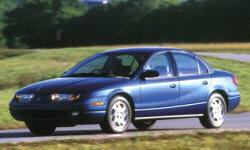 Why Not the 2002 Saturn S-Series? I expected the rear seat room to be similar to the sedan since they are built on the same wheelbase - this is not the case. Swooping roof line - a 6+ footer (myself) cannot sit without head hitting headliner! Some people might give you grief about Saturn being out of business (if that type of thing bothers you). Years to come - parts MAY become hard to get - if you need them. Not sure if this is the right category for this but - the one thing that I really disliked about my old Saturn is access to the oil filter. Very difficult for a do-it-yourself person compared to other cars I have owned. This Saturn is no different as it has the same drivetrain. With the great experience I had with the 94 - the 02 was a no-brainer. Considered getting larger cars - such as the Buick Regal and Hyundai Sonata. But, got a great deal on this car and have a good idea what to expect. Maybe Saturn should have kept with the S-Series instead of going to the ION! I have a S-series and agree that the oil filter is in a difficult place. I learned a trick online which makes it much easier: take off the right-front wheel and then move the plastic piece behind it. The oil filter is very easily accessible through the wheel well. Agreed- taking the fender liner off makes access easier. I just hate taking the wheel off and pulling the cover out to do it. I actually HAD to do this earlier this year - the oil was changed at a shop and I simply could not get the filter off! It's good advice to other S-Series owners.